“ We design Award Winning, Unique, Custom, Luxury Swimming Pools” Call us today ! TLC Outdoor Living is known as one of the top Houston pool builders because of their award winning custom pools and luxury pool environments. We offer our customers nothing less but the best in professional pool building services and give them the swimming pool of their dreams. TLC Outdoor Living is known for crafting some of the best luxury pools that come out of the Houston area. 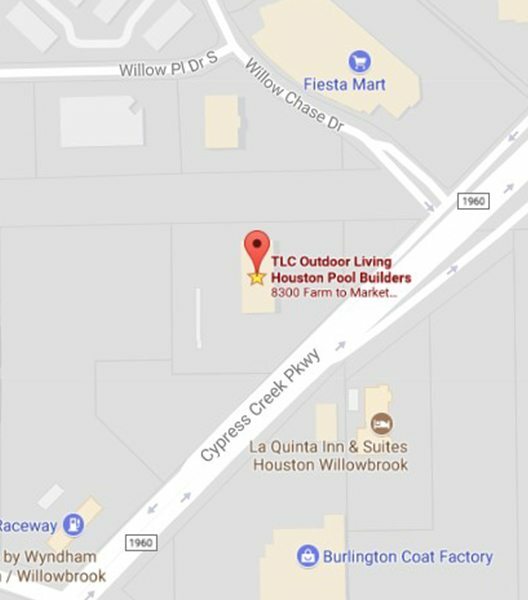 So if you live nearby, then you are just minutes away from one of the best luxury swimming pool builders and pool companies in Houston. Each builder employed in our team is considered the cream of the crop in the swimming pool design industry, and they will provide the same level of quality custom work to customers with swimming pools in the Houston area. You have always wanted to treat yourself with your own custom-built, resort-style luxury swimming pool, designed by a professional luxury pool designer. Now is the time to get off the fence and make one of the best home improvements that you could possibly make. Do this by simply adding one of the most luxurious and breathtaking custom additions to your home that you could make—your own custom-built luxury swimming pool. And even when you are not using the swimming pool for swimming, it would still give your home an awesome ambiance that will give you the best resort-like experience at the comfort of your own home. Just imagine what your backyard space would look like. With TLC Outdoor Living, it would be awesome, and it would change the way you live and appreciate your Houston-based life. At TLC Outdoor Living, we offer some of the most competitive prices in the Houston area, relative to the level of award-winning custom work performed by our custom luxury swimming pool builders. Our resort-like custom luxury swimming pools are like no other that you have seen. You will be amazed at how our professional team of builders transform your outdoor living space to a custom design and amazing work of art. Our luxury custom pools allow families to enjoy a spa-like experience in their newly transformed Houston-based backyard, for many years to come. And you will be happy that you did not have to break the bank to do it. You will not find a more reasonably priced custom luxury pool service in your area for the custom design work experienced with our company. What should you look for in a luxury pool builder? Everybody loves a beautifully designed luxury swimming pool, especially during the warmer months. For Texas homeowners who want to lounge around in the back patio, throw a huge backyard barbeque party and enjoy a refreshing swim in a new, luxurious swimming pool this summer, now is the time to utilize one of the top custom pool builders Houston has to offer, to build your Southern oasis. But how does one choose the right pool companies Houston for the job? There are many factors to consider when hiring luxury pool builders. Some homeowners are lucky to have friends or family members with pools who have worked with a good custom pool company in Houston in the past and who can provide references, but not everyone has those connections. Therefore, it is important to choose a swimming pool contractor or swimming pool company like TLC Outdoor Living that not only does a great job, but also delivers top notch service with integrity. 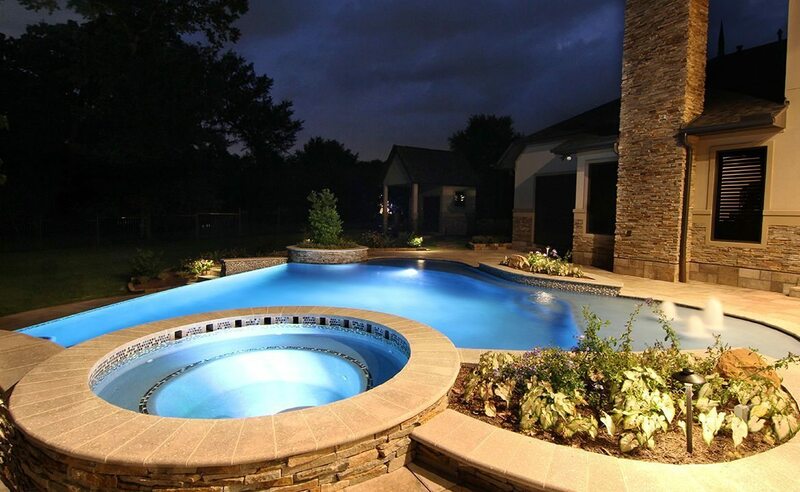 As one of the best Houston pool builders, TLC Outdoor Living (located in Houston, TX) takes pride in our professional services in custom pool design and construction. Many Houston home and property owners have opened their doors to the TLC team of professional custom pool builders to make their outdoor dream pool a reality! Our dedication to quality service and complete customer satisfaction pushes us to always do the job right the first time. If you are searching for THE best Houston pool builder to create your custom pool, look no further! TLC Outdoor Living has you covered. We have what it takes to design and build your next luxury pool! Each builder in our team is highly trained and has years of experience in the custom swimming pool industry. Therefore, you can guarantee that you are making business with a team made up of expert luxury pool builders and pool designers. They also offer consultation to give you a full understanding of what is most suitable for your personal outdoor environment. The builder assigned to a project will take an evaluation of your space requirements to best determine how much space is needed in relation to the space you already have, the architectural layout of your home, and other additional accessories you may want to install, such as spas, hot tubs, decks or pavers. We also have our own Design Center that can assist you with some additional custom design ideas, including aspects such as the shape and size of the custom pool and whether you would prefer to have a luxury pool. Our design team covers more issues that our customers may not be aware of or may miss to ask about. Only an experienced builder would be familiar with these additional areas, so it is pretty important to have a builder involved from the initial design process to the installment of your luxury custom swimming pool. To take it a step further, they can also provide other outstanding custom ideas, such as the construction of geometric shapes and personal preferences regarding custom construction in a modern or more contemporary look. As one of the top pool builders in Houston, we provide custom pool designs where customers may also choose to have a spa-like custom swimming pool or a more organic-shaped pool that requires being integrated more naturally to better blend with the natural backyard environment. Another popular construction idea is a visually stunning technique where luxury swimming pool contractors add a ‘vanishing edge’ feature to their custom pools. This means that there is an appearance of an optical illusion, where it seems like water is flowing over one side of the swimming pool, when it is actually being emptied into a catch pool that recycles it back into the pool. "Our Professional Staff Will Exceed Your Expectations"
Another great thing about our pool company in Houston is that in addition to providing our customers with luxury swimming pool designs, each builder also provides custom ideas by suggesting additional aspects in order for customers to better enjoy their custom backyards and luxury swimming pools. Our TLC Outdoor Living store has all of the necessary accessories that you could possibly imagine. We offer custom swimming pool design accessories, which include everything from chairs for lounging around the luxury swimming pool to garden accessories that will add spice and character to swimming pools and outdoor areas. In fact, we even have all that you need for a full outdoor kitchen. As a Houston pool builder, we have everything that Houstonians need and want in order to create award winning back yard designs year after year. The ability to do this is what makes us one of the best Houston pool builders out there. You can coordinate with a pool builder on our team to accommodate designs for your entire backyard area, for a more simple and personal enjoyment or for elaborate activities that may involve hosting and entertaining guests. We also have everything you need and will create a luxurious and custom poolside for your relaxation during the hot summer Texas afternoons or the warm Texas evenings. Whether relaxing or entertaining, we are your one-stop shop for everything you need for your outdoor living space! Let us face it! Everyone wants a perfectly designed outdoor living space that would literally take someone’s breath away, a picture-perfect outdoor space that makes one look forward to coming home to arelax and lounge. Well, that is exactly what TLC Outdoor Living has to offer. We craft beautiful livable spaces. If you are looking for the best outdoor living landscape space design and construction company in Houston, TLC Outdoor Living is the one that could make your dreams into a reality. From full outdoor kitchens to custom luxury pools, custom patio equipment and more, TLC Outdoor Living has it all.